A session in the CookLab is a true cultural journey. You will discover a part of French Polynesia by living a culinary experience. The CookLab offers a tour of the products, their history, their use more interesting we’ll be picking all the products we need from outside the CookLab. Jade proposes to make you discover the very traditional know-how in the Polynesian culture, you discover the use of the plants and the vegetable parts (banana leaves) in the preparation and the cooking. Visual kits allow you to understand the properties & history of the local products used. In the kitchen, equipped with simple tools like at home, you will combine the products, make the best sauces and accompaniments. 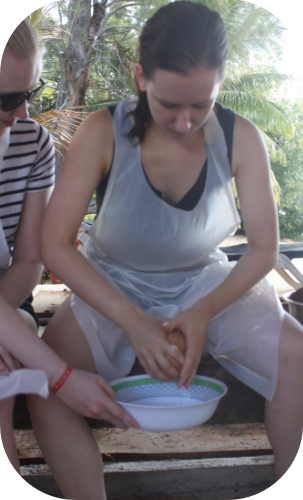 You will learn traditional cooking methods that reveal. Finally, because you deserve it …. you will sit down to taste your creations and enjoy together a pleasant time ! Throughout your journey, you will be photographed and filmed (timelapse) and all these media will be downloadable after your visit to the Food & CookLab. You will also have all the tips and recipes, and back home, you will be able to replicate the best of your culinary experience and share it ! We will also give you the replacement tips for products not available in your country! Everything is planned to live an unforgettable experience and keep it alive elsewhere and share it! All culinary experiences and workshops take place in a space designed to receive public. The space respects safety norms, accessibility & food safety. It’s like a friendly home kitchen, warm and simple combining electric appliances and more traditional equipment. Regarding the regulation, we refer to a note in France issued by the agricultural services, DGAL / SDSSA / N2012-8054 of March 08, 2012, p11 which states “the meals are consumed exclusively by the people who prepare them : it is about preparation, handling and domestic storage of food for private domestic consumption” .